Andre Braugher is an American actor. He is perhaps best known for his roles as Thomas Searles in the film Glory, as the fiery detective Frank Pembleton on Homicide: Life on the Street from 1993 to 1998 and again in the 2000 made-for-TV film Homicide: Life on the Street, and as Owen Thoreau Jr. on the TNT show Men of a Certain Age. Braugher, the youngest of four children, was born in Chicago, Illinois, the son of Sally, a postal worker, and Floyd Braugher, a heavy-equipment operator. He attended St. Ignatius College Prep and later graduated from Stanford University with a B.A. in theater in 1984. 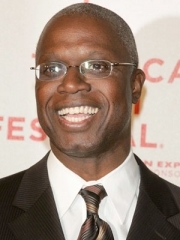 Braugher then attended the Juilliard School in New York City, graduating in 1988 where he was acknowledged as the Most Outstanding Theater Student at graduation. Braugher's first film role was in the 1989's Glory as Thomas Searles, a free, educated black from the North who joins the first black regiment in the Union Army. He subsequently moved on to a role on the television series Homicide: Life on the Street as Det. Frank Pembleton, a self-righteous, fiery, unyielding, Jesuit-educated police detective. Playing opposite Kyle Secor , Braugher became the series' breakout star. He received Television Critics Association awards for individual achievement in drama in 1997 and 1998. He was nominated for an Emmy Award for best actor in a drama series in 1996 and 1998, winning in the latter year. He left Homicide after its sixth season but returned for the successful reunion television film. He has also starred in the films City of Angels and Poseidon. He played Kojak's side-kick in the late-1980's ABC television film revival of Kojak. In 1997 he was selected by People as one of the "50 Most Beautiful People in the World". At New York City's Shakespeare in the Park Festival from June 18 to July 14, 1996 at the Delacorte Theatre in Central Park, Braugher played the title role in Henry V for which he received an Obie Award. In 2000, he played the title role as Ben Gideon in the series Gideon's Crossing, which lasted one season. In 2002, Braugher narrated the award-winning, PBS-broadcast documentary Muhammad: Legacy of a Prophet, produced by and recently re-issued. He played Detective Marcellus Washington in the TV series Hack from 2002-2004. In 2006, Braugher starred as Nick Atwater in the mini-series Thief for FX Networks, winning a second Emmy for his performance. He portrayed General Hager in the 2007 film Fantastic Four: Rise of the Silver Surfer. Braugher has been seen on the TV series House, M.D. as Dr. Nolan, a psychiatrist who helps House recover from his addiction to Vicodin. He also recently appeared in the highly acclaimed TNT series Men of a Certain Age, for which he was nominated twice for Primetime Emmy Award for Outstanding Supporting Actor in a Drama Series. The series was cancelled on July 15, 2011 due to low ratings. He also voiced the villain Darkseid in the animated film, Superman/Batman: Apocalypse. Despite the fact that Homicide and the Law & Order franchise share the same continuity, Braugher currently has a recurring role as defense attorney Bayard Ellis on Law & Order SVU -- even sharing screen time with former Homicide character John Munch -- with no reference to Braugher's role as Frank Pembleton. Braugher is co-starring in the Manhattan Theatre Club's production of The Whipping Man, off-Broadway, for a limited run from January–March 2011. Braugher has narrated the introduction to the Olympic Games on NBC since 2006, succeeding James Earl Jones in the role. Braugher also narrates James Patterson's new Alex Cross book, Cross Fire . In 1991, Braugher married Ami Brabson, an actress who later played Pembleton's wife Mary on Homicide. The couple has three sons: Michael , Isaiah , and John Wesley . They reside in South Orange, New Jersey. Braugher and his family are Unitarian Universalists. Whole or part of the information contained in this card come from the Wikipedia article "Брауэр, Андре", licensed under CC-BY-SA full list of contributors here.